We really like the flavours of this sauce and I’ve added a little twist to make this fun for St. Patrick’s Day – maybe the day you can get your kids to not realizing they are actually eating healthy green food. Peel and cut squash in cubes, drizzle with olive oil, season with salt and pepper and roast in oven at 400 for 20 minutes. You can also drizzle with a bit of maple syrup for an extra bit of flavour before roasting. Heat 1 tbsp of olive oil in pan and sautee garlic and onion until soft. Add wine and sage. Sautee for 2 more minutes. 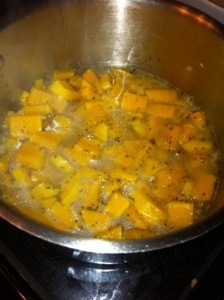 Add broth and squash. Bring to a boil and simmer for 7-10 minutes. 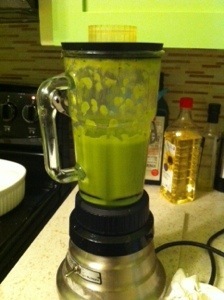 Let cool for a few minutes and use either an immersion blender, or a blender addin g your spinach before pureeing. 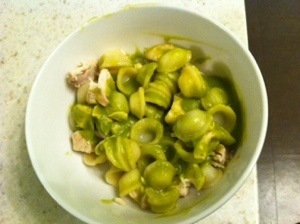 If you find the sauce too thick, you can thin it out with some water from your pasta. Normally this sauce is a dark golden yellow, but in honour of St. Paddy’s Day, I added some extra spinach (about 3-4 handfuls) and turned this a lovely shade of green. You can also use spinach pasta (I believe there are some gluten-free spinach pastas so says Google) if you are eating gluten-free. Other times that I’ve made this sauce I’ve cooked some bacon or pancetta and chopped it up, adding it after the sauce is blended. In this picture, you’ll see I added some left over chicken – that’s what I love about this sauce, it’s really versatile but it’s also wonderful on it’s own as a vegetarian option.